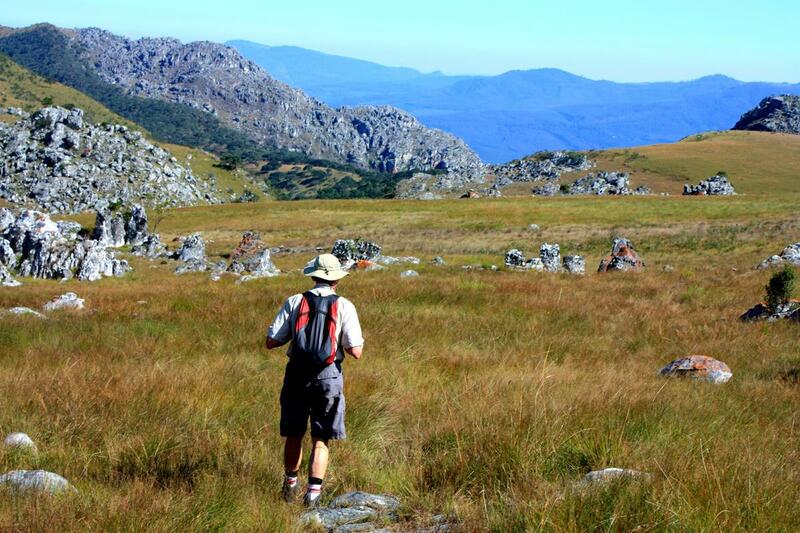 The Chimanimani National Park is without a doubt one of the jewels of the Eastern Highlands and a hiker’s paradise, known more for its scenic beauty than for its wildlife. Apart from the roads that lead into the camps, the park can only be explored on foot. The road leading to Bridal Veil Falls. 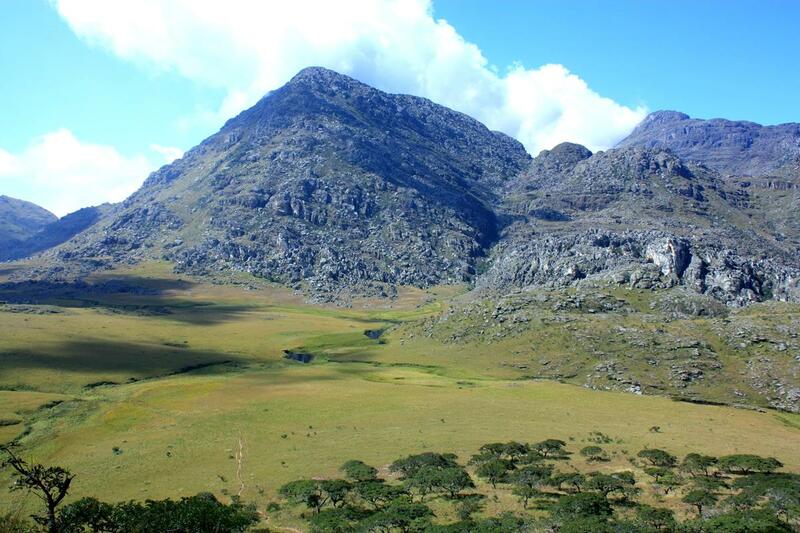 The small village of Chimanimani is the centre of many of the attractions in the Chimanimani National Park and one has to get permits at the Parks Boards office in town before you can venture into the park. 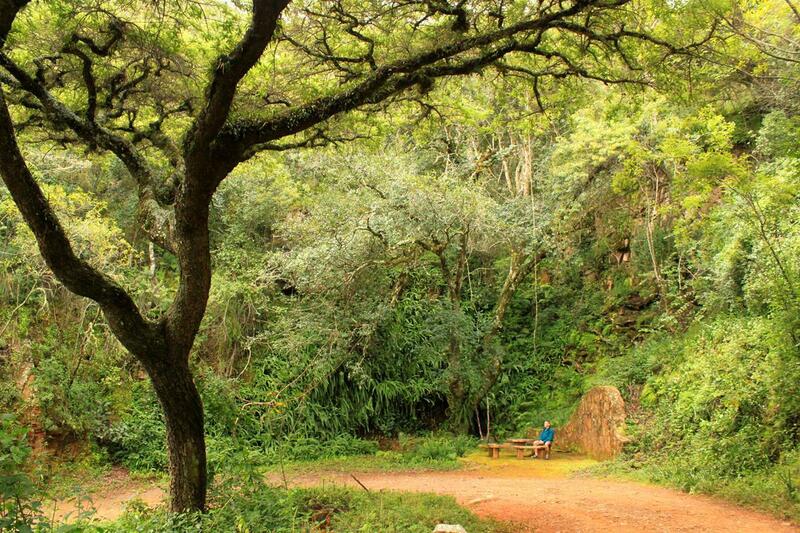 If you drive north from Chimanimani village you can enter the top western side of the park which hosts Bridal Veil Falls and Pork Pie Mountain. From the top of the mountain, which is 1 987m high, we had a stunning all round view even though it was a cloudy day. Apparently one can see as far as Mozambique on a clear day. The track up Pork Pie is definitely for 4WD only and low range was in demand both up and down as we crawled over steep, rough, rocky terrain. The view from Pork Pie. Bridal Veil Falls is simply awe inspiringly, not only for the falls itself but also the whole ambiance of the fairy tale setting. 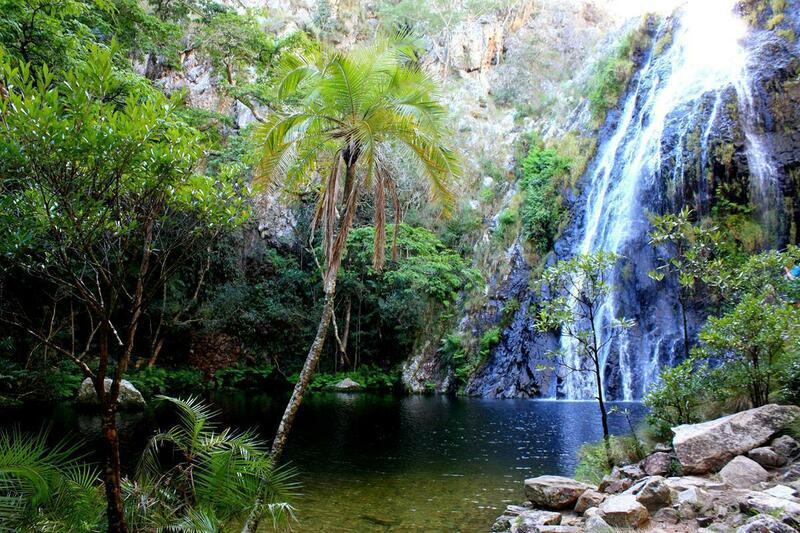 The falls are set within a narrow kloof and plunge 50 metres down black, narrow layers of rock into a dark pool about 10 meters wide. 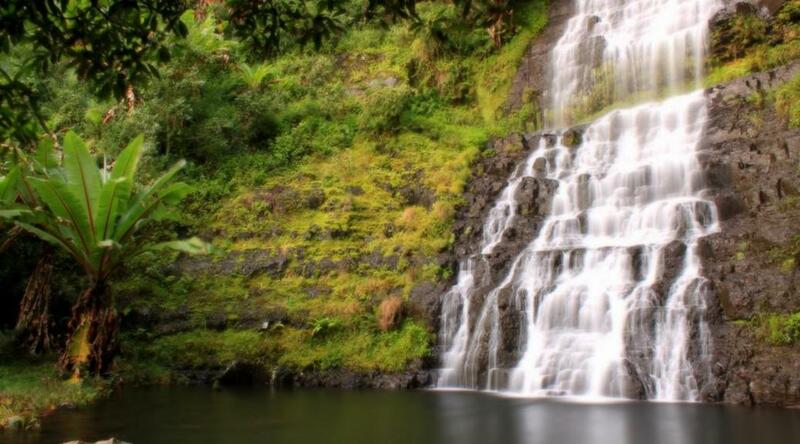 Its downdraught wafts spray onto luxuriant vegetation, dotted with broad leafed banana palms. 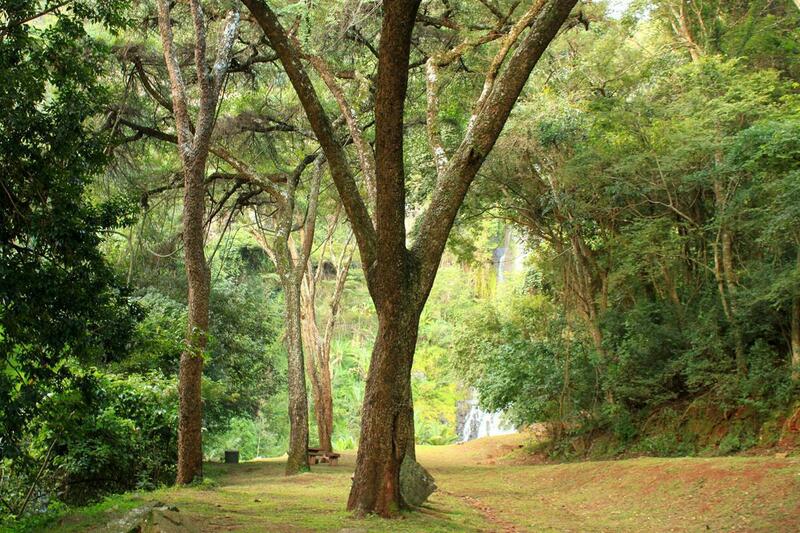 There is a picnic site and a campsite under majestic trees of which the Umbrella thorn trees (Acacia species) are for us, the most spectacular. Umbrella thorn trees with Bridal Veil Falls in the background. We were so touched by the beauty of the Bridal Veil Falls setting that we could not resist an unscheduled night stop there, having only had the company of a distant troop of baboons and a warm fire to offset the evening chill whilst we cooked dinner. Later, as we toasted in front of the blaze, a bright moon rose over the valley wall and the gentle breeze stilled completely. Morning dawned equally peacefully and after breakfast and another short walk up to the falls, we headed for the village where we spent an unproductive few hours trying to get organised with local SIM cards for phones and computers. Banking also proved to be a bit of a nightmare in Zim as most of the local ATMs won’t accept VISA or MasterCard. 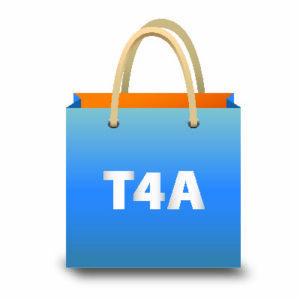 Only bigger towns have Barclays or Standard Chartered banks that accept these cards. Planning to spend our next two nights at the Mutekeswane base camp in the eastern section of the park, we arrived at midday. The Chimanimani Mountains rise to the east immediately above the camp, as does the hiking trail which we took the next morning, heading for the mountain hut and Digby’s Waterfall. 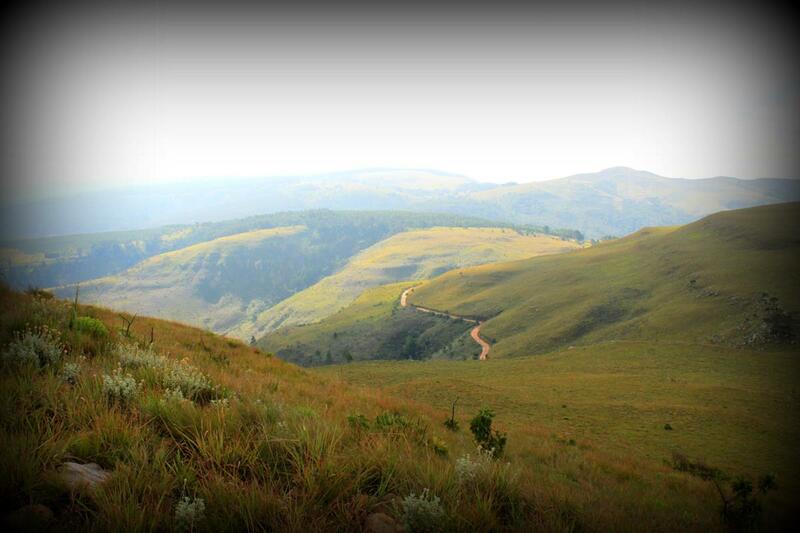 Hiking in the Chimanimani National Park. We had obtained an indistinct map, the product of a multiplicity of photocopies, whose initial and apparently marginal value increased markedly when the GPS battery died after a couple of hours. Following a steep climb during which we were treated to spectacular views and a wide array of vegetation types, we walked through a grassy plateau dotted with naturally sculpted rock formations. 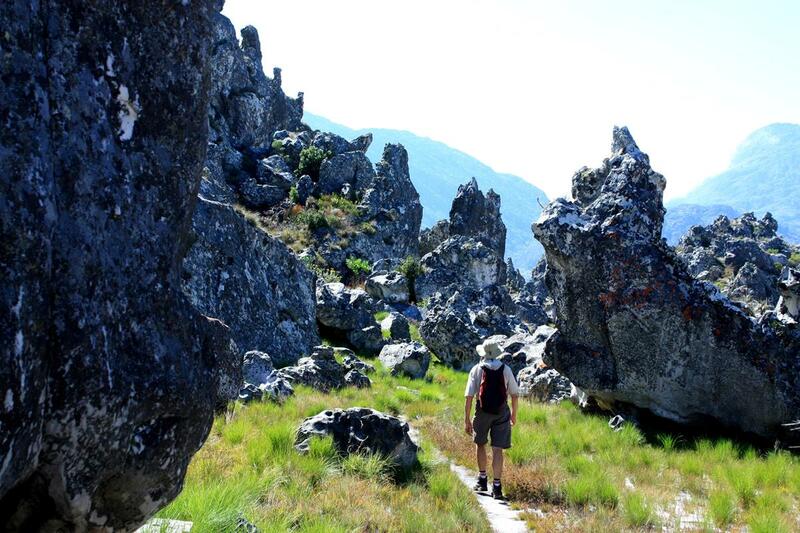 The Chimanimani Mountains boast beautiful rock formations. 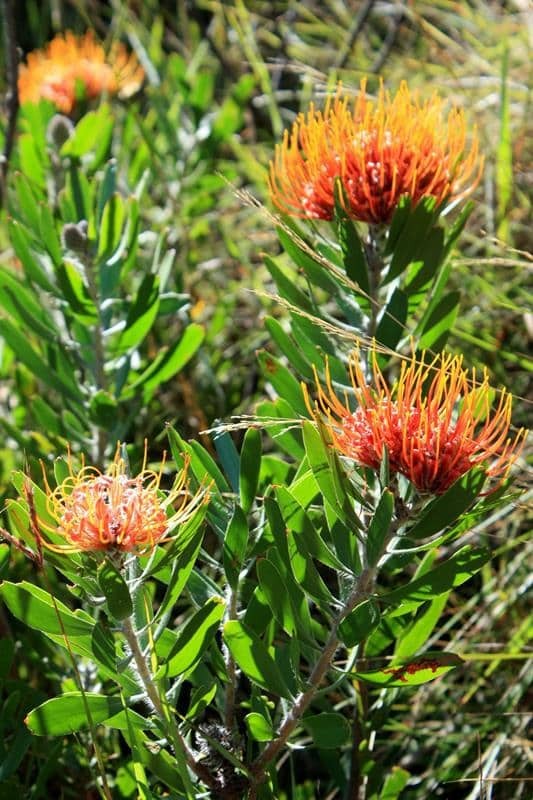 We were surprised to recognise many of the plants of the Cape Floral Kingdom, including fynbos. Some of the proteas were flowering but sadly none of the many orchids and it was astonishing to see succulents growing only a few meters from orchids. The stone mountain hut has a commanding view west, perched on the edge of a flat ledge. It is currently being refurbished and comprises a large living and cooking area as well as four large bedrooms with mattresses. All the material required is backpacked in daily by the maintenance staff, taking them two hours either way. It took us closer to three hours to climb the almost 400m from our camp to the hut which is 1 630 m above sea level. Mount Binga seen from the mountain hut. From the hut a few trails lead to the many caves and waterfalls within the park. We took a short break at the hut and ate meagrely as it was clear that we were in for more than the four hour walk for which we provided snacks. After Digby’s Waterfall and refreshed by a quick dip in the chilly pool below the waterfall, we retraced our steps to the hut, climbed to the plateau and took the Long Gully route home. With relief we reached the final small stream near the camp after seven hours. On the morning of our departure we drained and refilled out water tanks as we had realised that without some form of preservation, any clean natural water would go green and taste distinctly algal. Adding a cap full of Milton (a chlorine solution) to each tank solved this problem. The beautiful Tessa’s Pool is situated on the verge of the National Park but on the premises of the Outward Bound Adventure facility. Even though it is on private property they permit public entry, especially if you can show your park permit. A brief walk into a rocky kloof brought us to a short but impressive cascade, dropping into Tessa’s pool which is large and clear and surrounded by lush and varied vegetation. It is indeed another jewel in the Chimanimani crown. As Pete grew up in Zimbabwe we had arranged to visit some of his relatives who are still farming on Humani Ranch in Save Conservancy. The ground drops rapidly from Chipinge down to the Save River lowveld, with a significant rise in temperature and the occurrence of dry land vegetation, including baobabs. 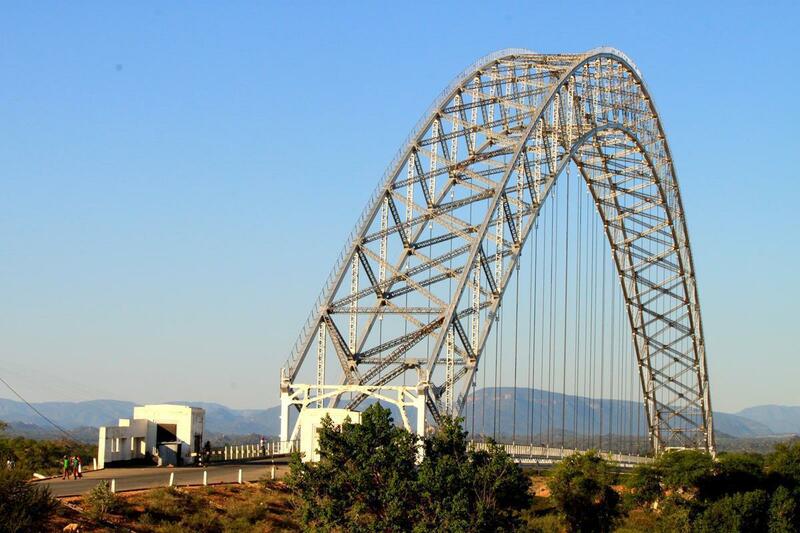 The impressive silver painted structure of Birchenough Bridge, modelled on the Sydney Harbour Bridge, provides access across the Save River. The conservancy was established in the early 1990’s when a number of farmers agreed, after a severe drought, to diversify from cattle to game farming. Today it teems with game, including the Big 5. Zebra in the Save Conservancy. Vegetation varies markedly in this area, with some of the most pleasing and evocative African bush that either of us have ever experienced. Dense riverine growth occurs along the watercourses which often quickly transitions to small patches of bush interspersed with open areas where the soil has been trampled to dust by the passage of hooves. Mopane forest gives way towards the Save River to open veld with one of the largest forests of stately Ilala palms which are dotted amongst the baobabs and other hardy trees that surround the pans. The sun is setting over the Turwe River. We thoroughly enjoyed our break from camping, staying in a charming, open-walled thatched guest cottage for four nights. 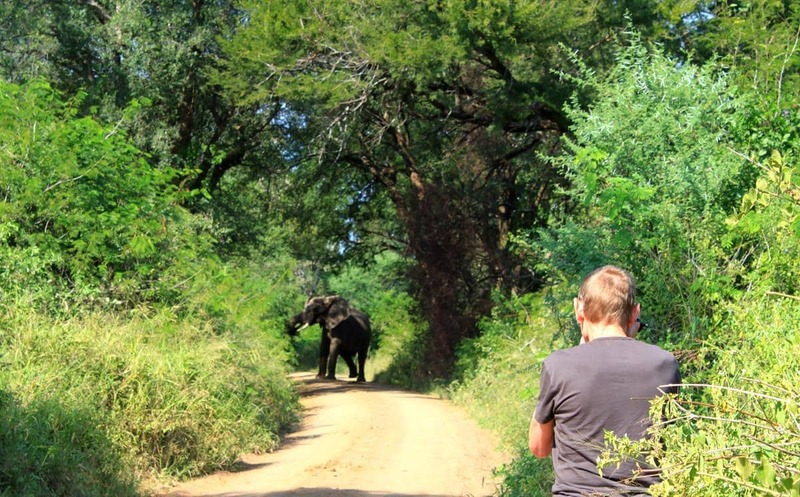 We went out on a game drive early most mornings and would drive until it was time to eat and then stop under a shady Acacia tree and prepare coffee and breakfast. Having tea on a pan in the Save Conservancy. 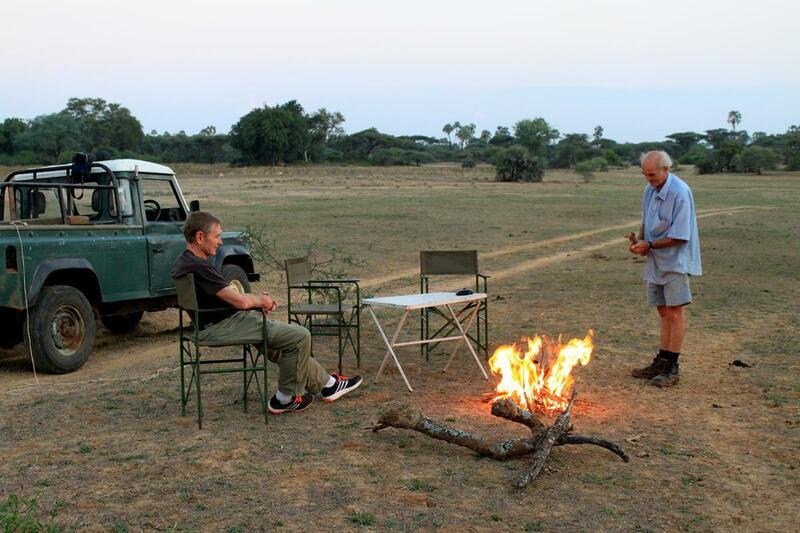 Our charming host, Richard Whitall, took us on two late afternoon drives, when, towards evening, we stopped on wide, open pans and built a fire to boil water for tea. We’d listen to the sounds of the bush as the fading light put the palms and baobabs into silhouette against a red sunset. Then, with headlights on, we’d head home, the cool air full of the scents of the evening bush. The Save Conservancy offers great photographic opportunities. The Save Conservancy is sustained by hunting and photographic safaris but there is also substantial agricultural activity on Humani Ranch. 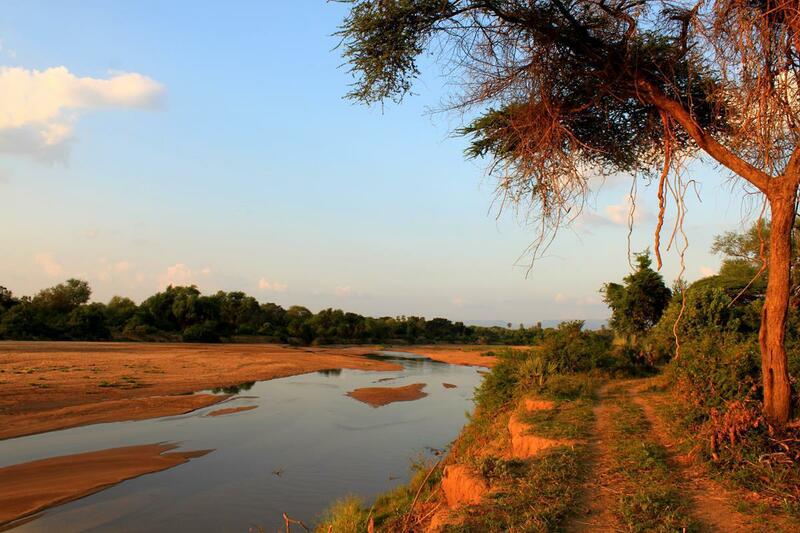 There are a few accommodation options in the conservancy and we visited Turgwe River Lodge, situated high up on the river bank, with excellent views of this watercourse, all bedrooms facing onto the river and completely open at the front. Numerous desperate and futile attempts to post the previous blog entailed getting up early to find the strongest signal, driving to the top of koppies and even climbing on top of a cement tank. 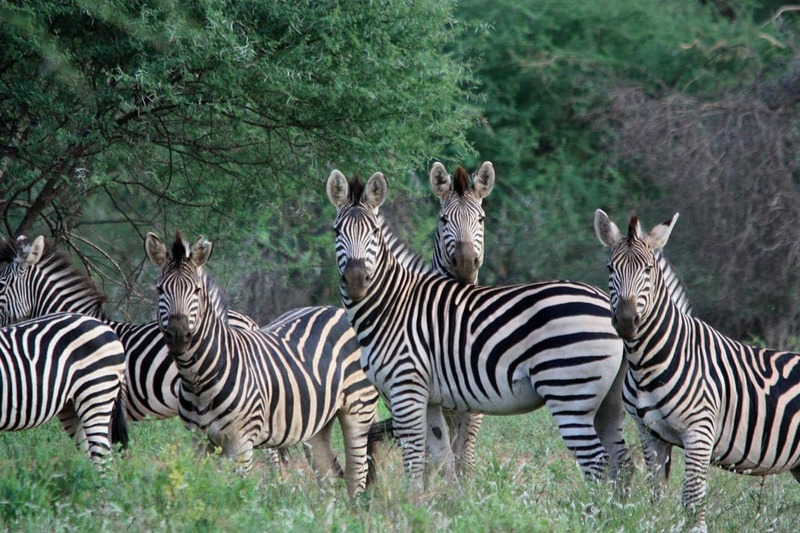 Without luck it was time to move on to the Gonarezhou National Park. En-route I kept an eye out for signal and finally managed to post the blog next to the roadside. Meanwhile friendly, helpful people pedestrians stopped to ask if we perhaps needed help. We are amazed at the contentment of the local Zimbabweans, despite their ailing economy. Since the Zim Dollar became virtually worthless the US Dollar is now the ruling currency. I have never seen such filthy money as the one and two dollar notes, most probably because the local Reserve Bank cannot replace them with new bills. It seems that nearly all roadside produce in Zim costs one dollar, from a loaf of bread to a bunch of tomatoes. Interestingly one gets change in South African Rand or, failing that, a few sweets. Both the South African Rand and the Botswana Pula are accepted in the south of the country and the government has recently minted Bond Coins to be used as change. Lovely! Lesson for GPS use on foot: carry spare batteries…. Wonderful pictures and great text, very envious. Regards and good luck. Great report and it sounds like you guys are having a fantastic time.